JNN 16 Aug 2014 Washington : A Prince William County mosque in the state of Virginia, was vandalized Monday night or early Tuesday, and Muslim leaders described the incident as a hate crime. 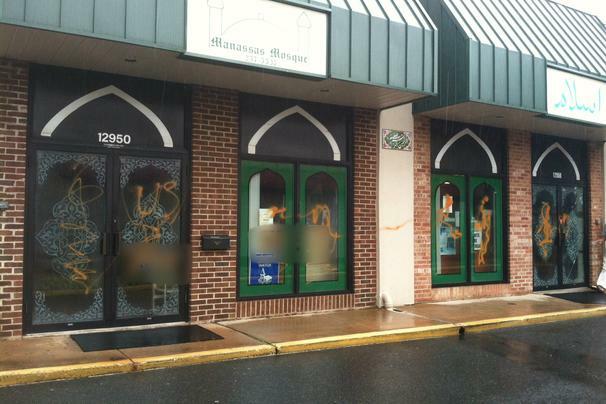 Abu Nahidian, the imam at Manassas Mosque, said he arrived Tuesday morning to find an expletive written twice in spray paint on the windows of the mosque that he helped found 20 years ago. Eight windows were defaced, and a glass door was shattered. Because the mosque has a double set of doors, the house of worship could not be entered, Nahidian said. The mosque has been vandalized before when tensions in the United States ran high over violence in the Middle East, Nahidian said. The last previous incident was three years ago. A statement issued by the Council on American-Islamic Relations characterized the vandalism as a possible hate crime and asking police to investigate. Nahidian estimates that replacing the door and removing the paint from the windows will cost $1,000. In the meantime, 20 to 25 children who participate in the mosque’s summer classes had to walk past the obscenities to get inside Tuesday morning. This entry was posted in America, Uncategorized, United States and tagged Abu Nahidian, Graffiti, Hate crime, Manassas Mosque, Prince William County, Prince William County police, state of Virginia, Tuesday morning. Bookmark the permalink.